Mashed Potatoes with two kinds of cheese? Ummm yes please! 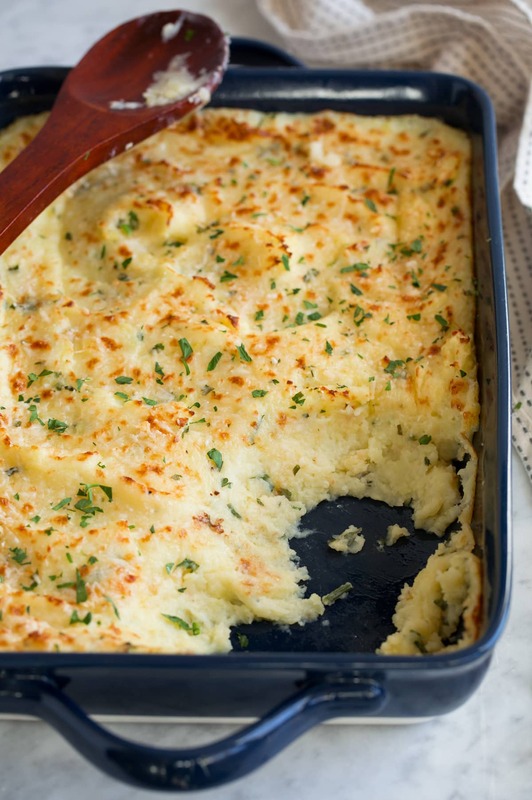 For this recipe potatoes are boiled and mashed then you toss in parmesan and mozzarella cheese and bake them until they’re deliciously golden and fluffy. 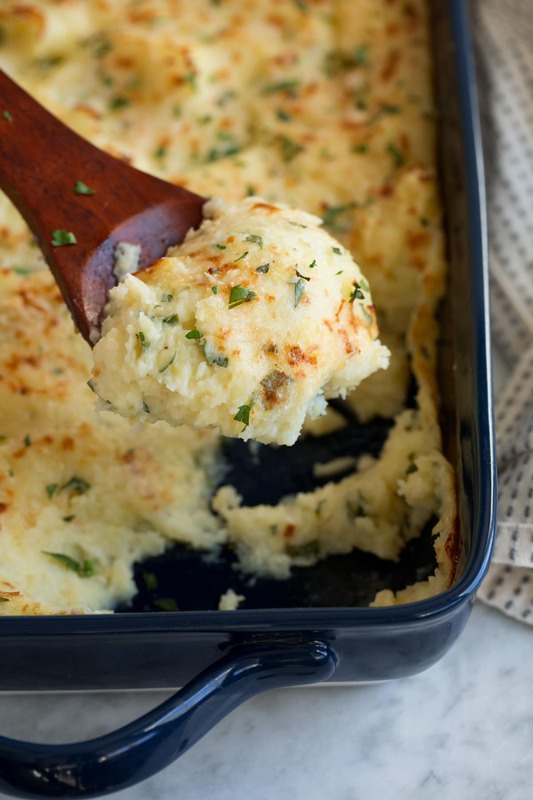 These are perfect for holiday parties and a fun change from the traditional mashed potatoes. 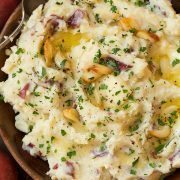 Everyone has had mashed potatoes and gravy but how many of us have tried mashed potatoes with a cheesy Italian flair? They’re deliciously flavorful and oh so comforting! Plus this is a great recipes to make when you don’t have drippings from a beef or poultry for gravy. This is one of those homestyle recipes with an exciting makeover people will love! Preheat oven to 400 degrees. Grease a 13 by 9-inch baking dish. 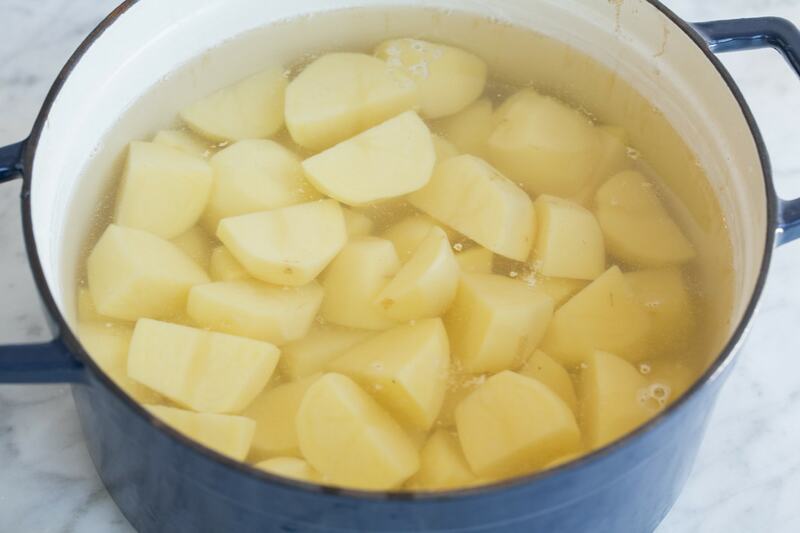 Place potatoes in a pot and cover with water until potatoes are covered by an inch or two. 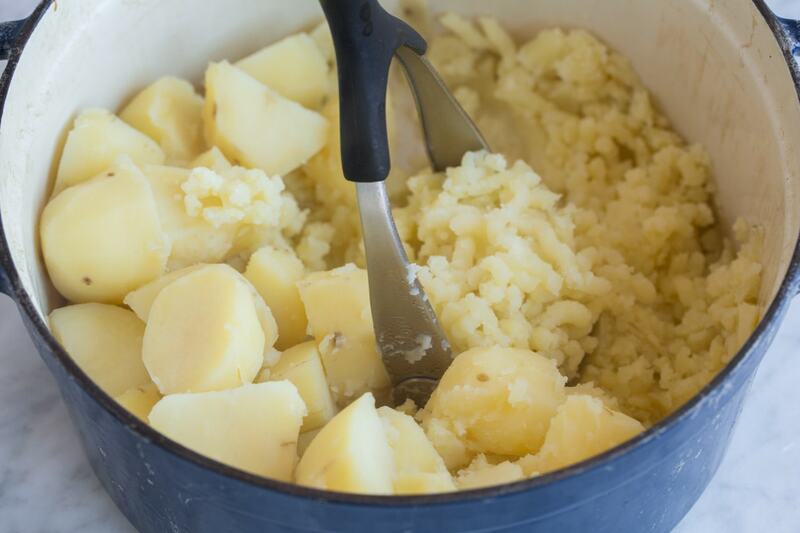 Bring potatoes to a boil over medium-high heat, then reduce heat to medium low and simmer until very tender when pierced with a fork, about 15 – 25 minutes. Meanwhile melt butter over medium heat. Add garlic and saute 30 seconds, set aside. Drain potatoes, return to pot and mash well. 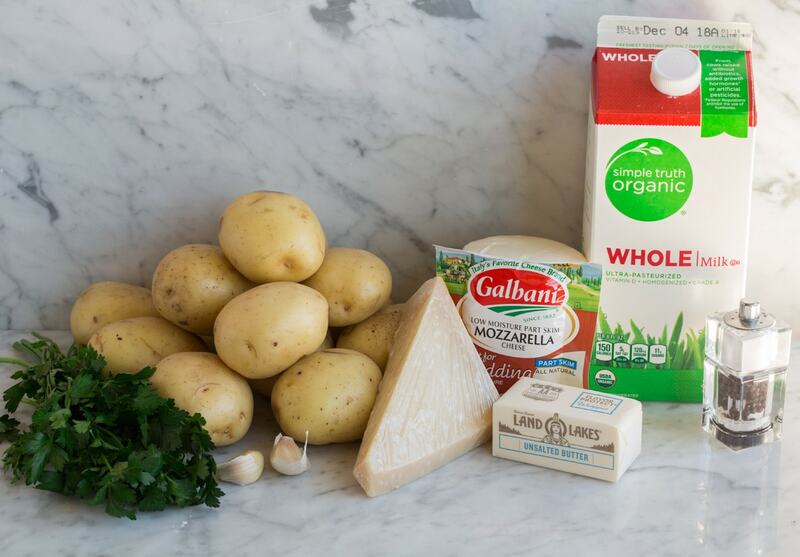 Add butter mixture to potatoes along with, milk mozzarella, 3/4 cup parmesan, and 2 Tbsp parsley. Stir, thin with a little more milk if desired, season with salt to taste as needed. Pour mixture into prepared baking dish, spread into an even layer. Bake in preheated oven 20 minutes, for better browning on top move closer to broiler and broil briefly (1 – 3 minutes.). Garnish with 1/2 Tbsp parsley and serve warm. This recipe will work great with both yellow (yukon) potatoes or russets so use what you prefer. Yellow are a little creamier and russets are a little starchier. Try not to overwork/over-mix the potatoes or they can turn out gluey. The parsley adds a very light flavor and a nice color but feel free to omit it. The golden brown topping is best achieved by broiling briefly, it’s optional but that golden brown cheesiness is delicious! Can I Reheat These Potatoes? I recommend serving this just after preparing for best results. 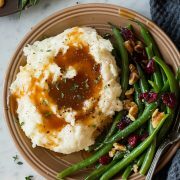 Have you planned out your Thanksgiving menu yet? This would be the perfect side dish to add to the feast this year! Then check out my other favorites you might want to add to that list too! 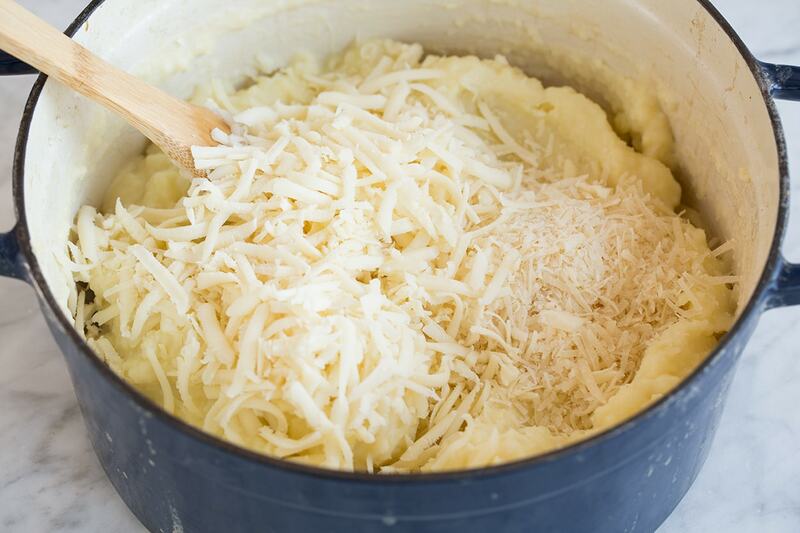 Mashed Potatoes with two kinds of cheese! 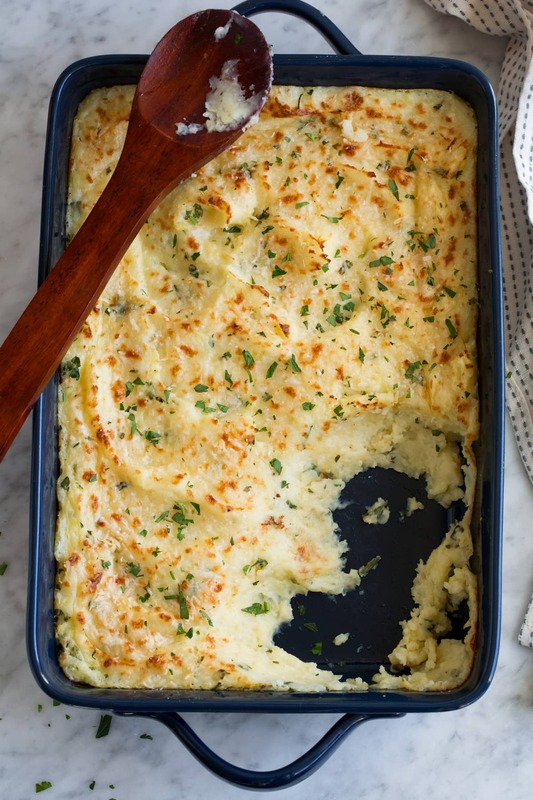 For this recipe potatoes are boiled and mashed then you toss in parmesan and mozzarella cheese and bake them until they're deliciously golden and fluffy. 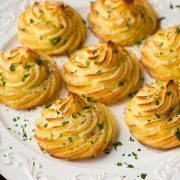 These are perfect for holiday parties and a fun change from the traditional mashed potatoes. Bring potatoes to a boil over medium-high heat, then reduce heat to medium-low and simmer until very tender when pierced with a fork, about 15 - 25 minutes. Meanwhile melt butter over medium heat. Add garlic and saute 30 - 60 seconds to remove harsh bite, set aside. 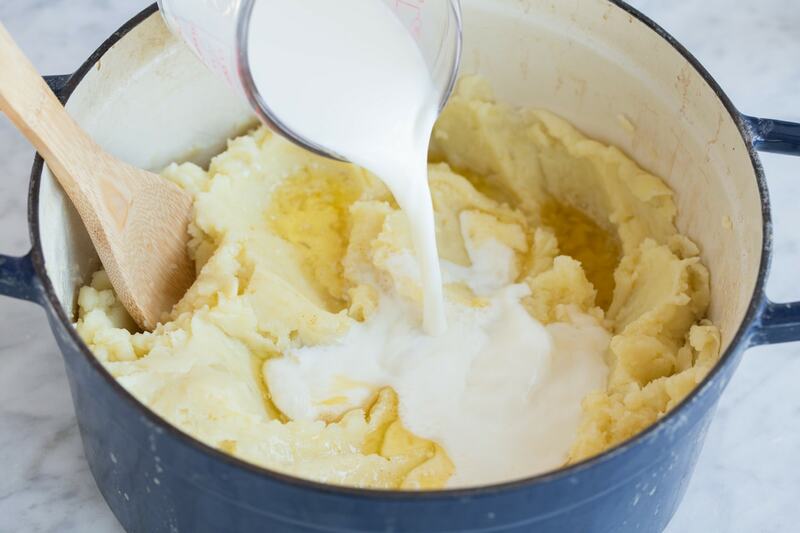 Drain potatoes, return to pot and mash well or pass through a potato ricer or food mill. 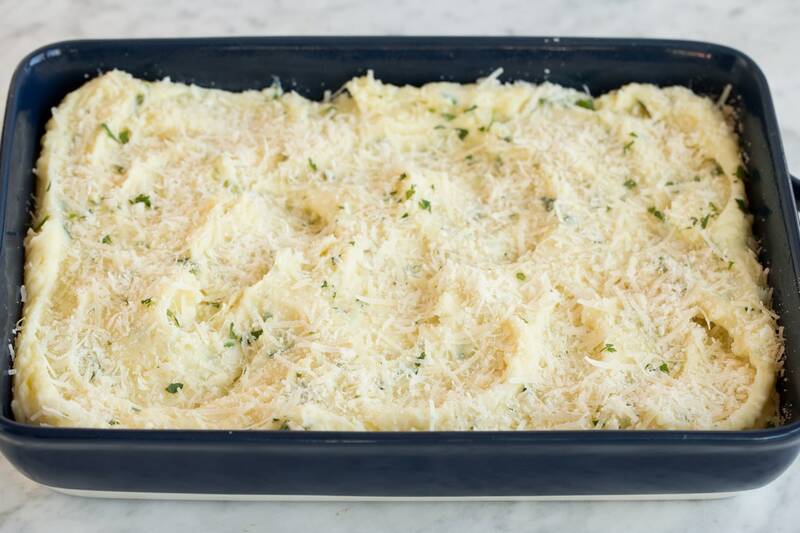 Add butter mixture to potatoes along with, milk, mozzarella, 3/4 cup parmesan, and 2 Tbsp parsley. Stir and thin with a little more milk if desired and season with salt to taste. Pour mixture into prepared baking dish, spread into an even layer. Sprinkle remaining 1/4 cup parmesan over the top. Bake in preheated oven 20 minutes, for better browning on top move closer to broiler and broil briefly (about 2 - 3 minutes.) during last few minutes of cooking.